We had reported earlier about the VoIP calling feature that was added to Gmail where you could make phone calls directly from your browser. Today Google tweeted that it had 1,000,000 calls made in the first 24 hours of the service being launched! This new service lets you make free phone calls to US and Canada. Calls to other countries could be made at low affordable rates. Users could make calls however your call will be received by some California number that starts with 760-705-8888. 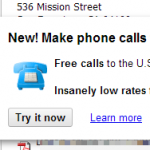 We speculate Google will soon have caller id feature and even a feature where you can recieve calls via Gmail! You can read Google’s tweets here. You can read more about the feature itself here. Next YouTube now offers Movie Streaming, 400 Titles in already!